The old town of Ochsenfurt has to be explored with all senses. It is nice and good, if you catch one of the many Sundays in Mainfranken. But it definitely does not hurt to sneak through alleyways, main street, and the city moat on a dull, rainy day. Because then, the feeling of being in a different time is perhaps especially great. And not only during summer a visit is a good idea. Even in the winter, when – which unfortunately is more and more rarely the case – the city moat and roofs are covered with snow. 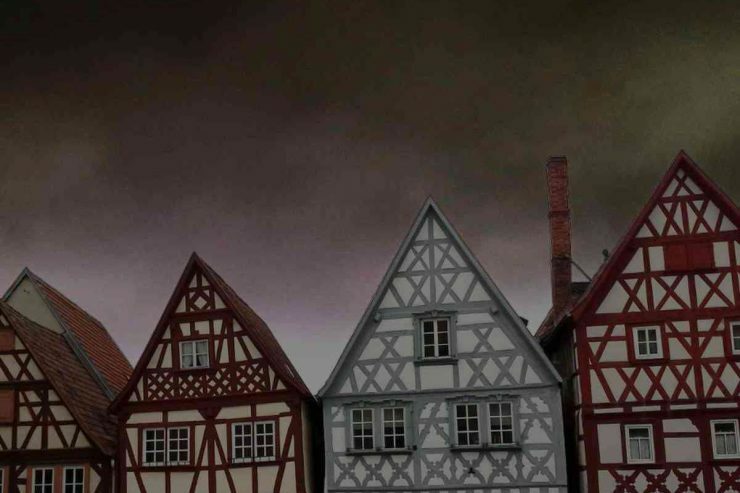 In order to see and feel the medieval origins of the city of Ochsenfurt, one must not yet have entered the city. 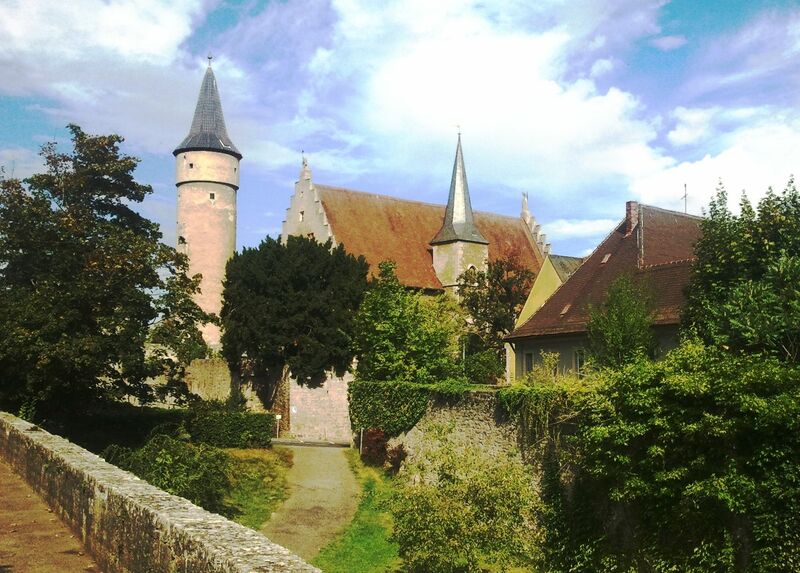 The exceptionally well-preserved city wall and its partly imposing wrought-towers, which still contain cannon balls from the Seven-year war, make it very easy to grasp how old and equally Franconian the walls are which you are approaching. The fact that Ochsenfurt looks back on many centuries of history can already be seen from outside the old town. 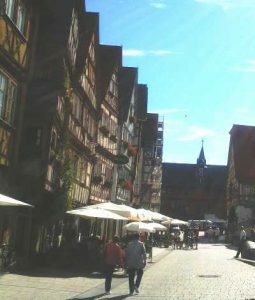 The half-timbered buildings typical for Franconia can be found within the medieval walls, just like the sacred buildings, which simply belong to a 1,300-year-old city like Ochsenfurt. The old town stretches over an area of ​​about 400 meters in length and 500 meters wide, bordering directly to the river Main in the north. All the sights are within walking distance. But one should not be deceived. 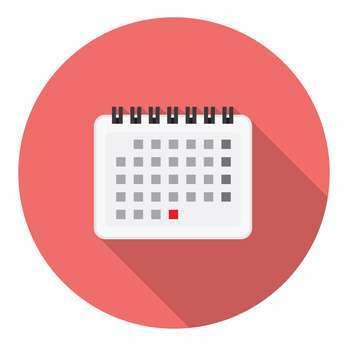 In order to be able to experience everything properly, you will have to plan more than “just an hour”. To ensure that visitors do not have to contend with traffic noise and crowded streets, traffic calming and stepping speed have prevailed in Ochsenfurt for quite some time. Despite the fact that cars do drive over the main street of the old town you quickly get the impression that you as a pedestrian or a cyclist in Ochsenfurt are the boss in the ring. If you would like to remove the city from the list of places you’d like to visit in the region, since you are traveling by car: Do not worry. Parking lots in the immediate periphery of the old town exist more than enough. Either you use the car park, which is located at the eastern city gate. Or you park your car free of charge at the large-scale Main (the river!) car park. But how exactly to explore the Old Town of Ochsenfurt? One possibility would be to circumvent the old town along the city wall. What is important ist to go to the south and the west and follow the city wall here, partly through the former moat, along the “Zwinger”. The might of the city fortification can probably be best experienced by starting the tour in the west and then continuing southwards along the Zwinger to the eastern end of the town. In this sense, you should start from the “Mainparkplatz” (car park along the river) and from there into the “Untere Klingengasse”. At the beginning of “Untere Klingengasse”, one of the oldest buildings in the city, the lower gate, or the old smithy, is already on the right hand. At the end of the Untere Klingengasse you enter the main road. To the right: The Klingentor. Through this gate you go through, in order to turn finally left into the moat. From there you have the perfect view from outside the defense system into the city. The route then continues along walls and moat. 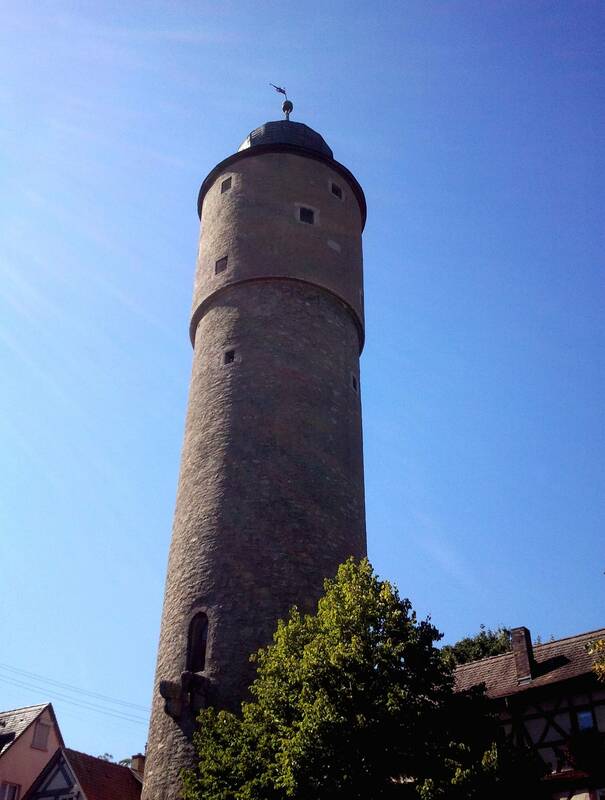 The Nikolausturm and the Pulverturm will fall into the eye next. Along the Nikolausturm you have a good view of the “Domkapitelsches Palladium”. 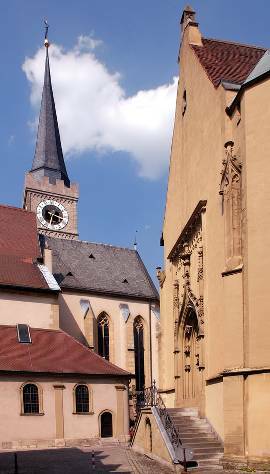 The imposing building dates back to the late 13th century and served the clerics of the Würzburg Cathedral as a residence and storage space. As storage space, it was predominantly – as might be otherwise – used for storing wine. The Nikolausturm is the Bergfried of the complex, which was originally immured. The large tower was thus a kind of main tower for the purpose of defending the building complex. Also it was good for gainig a perfect view over the surrounding countryside and possibly approaching enemies, as well as storing goods. From there, we continue along the ramparts, parallel to the Zwinger. Finally, the path leads to the left and you will already be very close to the “Obere Tor” (upper gate), the eastern gate of the 14th century. Ochsenfurt has an old and a new town hall. The library of Ochsenfurt is now housed in the old town hall. You can not miss the building if you go from the upper gate to the new town hall and finally St. Andreas church. The old town hall with its well visible pillory, is located directly on the corner of Hauptstraße / Brückenstraße, opposite the main church of St. Andreas. 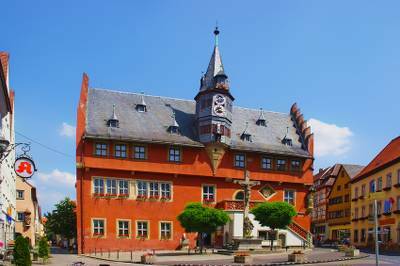 It dates back to the 15th century but was only used for a few years until the construction of the new town hall began. The new town hall still serves as the seat of the mayor of the city. The freestanding gothic building with saddle roof construction is centrally located in the main street. It dates back to the late 15th century. Particularly worth seeing is the figure playing of the so called Lanzentürmchen. Every hour, the play of figures moves all the elements of the city that were important for the time. Amongst others, there are oxen for the city as a whole, the skeleton with the hourglass admonishes to humility, as does the moon dial. Bearded men, the rulers of the town, look out of opening windows together with the mayor and over the city to the west. The main church of St. Andreas is located on a small hill at the western end of the main road. Here, as early as the ninth century AD, the church was built, commissioned by the chancellor of Louis the Great (the last Franconian emperor and son of Charlemagne). As often happened, buildings were broken down by fire or by raids and then rebuilt on their ruins. This is probably the explanation for the slightly elevated position of St. Andrea’s Church. The six-storey bell tower of the church dates back to the 13th century. At this time also the consecration of today’s St. Andreas church took place (1288 ad. Chr.). Choir and sacristy were built in the 14th century, the Gothic side chapels in the 15th century. The St. Andrea’s Church is home to a series of very old and valuable wooden figures. Among them is the figure of Saint Nicholas, a work by the great sculptor Tilman Riemenschneider.